Custom designed and custom manufactured for one of Germany’s premier luxury vehicle manufacturers and their Tier One suppliers, these custom fabricated Carousel Racks cradle delicate stamped-metal parts and body panels so that they can be shipped densely, without marring their paint-ready finishes and with no need for bubble wrap, tie downs, etc. 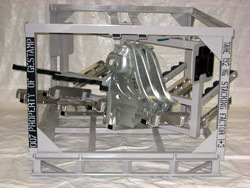 Integral swing arms are especially designed for specific parts and keep them secure in transit. Upon delivery, placed line-side, the carousel configuration allows one side to be loaded as the opposite side is emptied, either robotically or by material handlers. 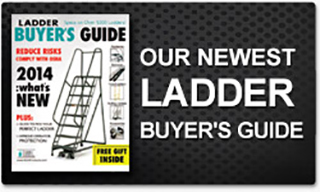 This eliminates the need to reposition racks as parts are expended. The smoothly turning carousel is easily rotated by a single person, and a one-step latching mechanism locks it in place. If we can do this for them, what might we do for you? Rely on EGA precision engineering and manufacturing expertise to design and fabricate custom racks like these, and other equipment that will meet the specific people-access, materials-handling, or storage needs of your industry and its processes—no matter how simple or complex your requirements. Or know more about our other Custom Designed & Fabricated Products. We enjoy working with EGA because they are the complete package supplier. First - their products are reliable, priced competitively, and ship in a reasonable period of time. Second - as a dealer who appreciates current information at their fingertips, we use their website daily to review pricing and appreciate that we don’t always have to make a phone call. If we do have to make a phone call, EGA’s customer service is personal and top-notch. Third -EGA’s communication is unlike any in the industry. You receive a personal phone call when your product has shipped allowing you to pass on excellent customer service to your customer.